Visiting the United States capital city is something everyone should do at least once. 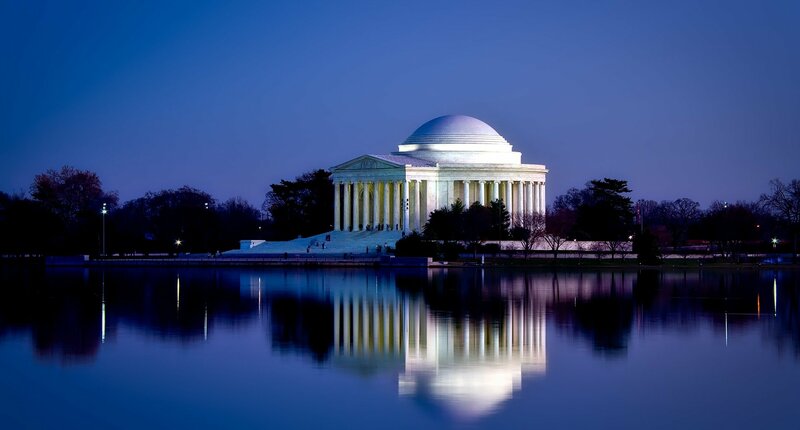 In addition to being the heart of government operations, Washington, DC is home to some of the country’s most famous historic sites, museums, and monuments. However, there’s a lot more than these to see and do in this city. Wandering around the different neighborhoods will bring you to local restaurants, cute coffeeshops, farmers markets, and art galleries. Because of its local charm and the difficulty of driving and parking inside of the city, it’s important to choose where you stay wisely. Here are a few of our top recommendations for where to stay when visiting Washington, DC. Bustling, corporate, and strategically located, the downtown area of DC is by far among the best places to stay in Washington, DC if you want easy access to the Smithsonian Museums, the most famous monuments, and the Potomac River. For travelers without a car, the Downtown area grants particularly easy access to public transportation – buses, metros, and bike shares. Additionally, Downtown houses the largest concentration of hotels, where you’ll often find international diplomats, business people, and tourists alike. However, because of its proximity to the main stretches of Washington DC, it is also the priciest area to stay. If you’re looking for one of the most convenient and accessible places to stay in Washington DC, consider staying in the Downtown area. Budget: Because Downtown is the prime location for tourists and business travelers, budget options are extremely limited and there are no hostels. However, occasionally you can find a central Airbnb at a decent price (if you are new to Airbnb and book with that link, you can get $40 off your first stay!). 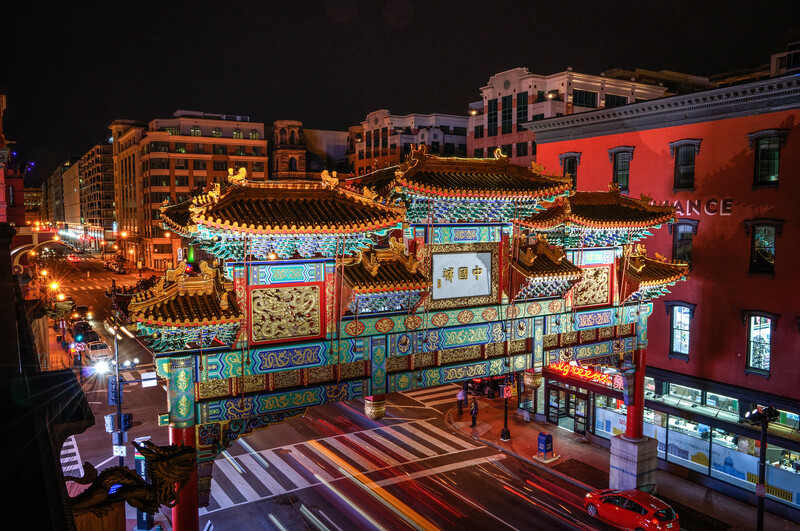 Located just above the National Mall is the Chinatown area, characterized by its signature, Chinese-style gate. Although there are sadly better places in the city to actually eat Chinese food, Chinatown is right in the middle of all of the action. Within Chinatown, you can find the International Spy Museum and the National Portrait Gallery, as well as several restaurants and shopping areas. It’s also a fantastic place to stay if you’re planning on attending a concert, as many of the city’s main concert venues are within walking distance. With easy access to the Green, Yellow, and Red metro lines, as well as several bus lines, Chinatown is a wonderful place to stay if you’re looking for something outside of the main downtown area. This neighborhood is walking distance to the Verizon Center, the Convention Center, and other museums in the central part of the National Mall. Note that although this is not the downtown area, it is still pretty touristy. Budget: For solo backpackers looking to save money and meet people, HI – Washington, DC Hostel is a great hostel choice. For budget travelers traveling in a group, I recommend getting an Airbnb – it’s likely cheaper and more comfortable than staying in a hostel (if you’re new to Airbnb, you can save $40 off your first stay by using that link!). If you’re a young professional or a group of friends looking for a neighborhood with amazing food, relaxed vibes, bumping nightlife, and hordes of other young people, Logan Circle is one of the best places to stay in Washington DC for you. Incredible dining and shopping is available on buzzing 14th Street, the heart of the Logan Circle area. The happy hours and nightlife of U Street are a short walk away. Located within walking distance of Chinatown, Mount Vernon Square, Farragut Square, Dupont Circle, and more, Logan Circle is a perfect neighborhood to stay in to experience the best that Washington, DC has to offer. Logan Circle and Shaw are accessible by public transportation via the Red or Green/Yellow lines. Situated in the heart of buzzing nightlife, friendly neighborhood farmers markets, and a more laid-back vibe than Downtown, Dupont Circle is the perfect place to spend a weekend. There are a lot of local businesses and fun events that happen in this area, so it’s great for young people who want to explore or families who want a bit more of a neighborhood vibe. Be sure to check out some of DC’s most famous restaurants here, including Duke’s Grocery, a popular local eatery. Dupont Circle is located on the Red metro line, for easy access to the Downtown tourist areas or Union Station (Amtrak and buses). 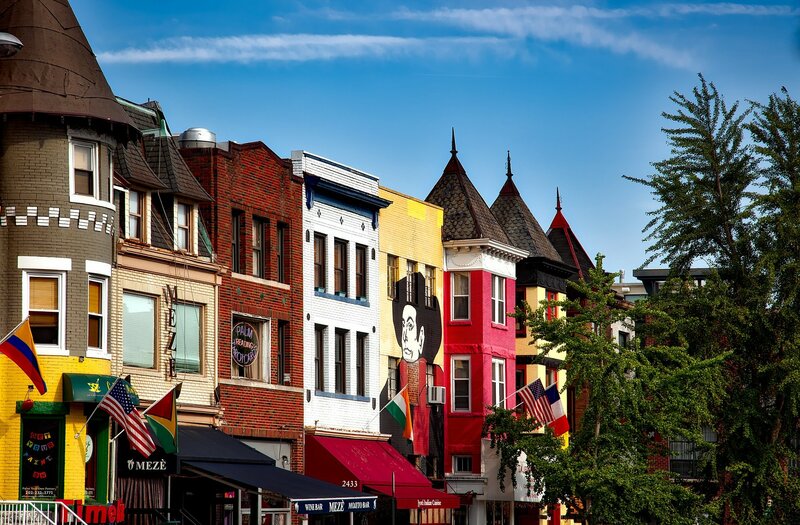 It’s also a wonderful place to get lost in the nearby residential areas like Kalorama and Woodley Park, with their charming row houses and tree-lined sidewalks. There are also Airbnbs aplenty in both Dupont Circle and Adams Morgan (and you know the drill…you can use that link to get $40 off your first stay!). If high-end shopping, university vibes, or waterfront strolls on the Potomac are your jam, Georgetown is likely one of the best places to stay in Washington DC for you. Georgetown is always full of energy, and whether it’s people dancing on the banks of the river or runners darting through crowds of shoppers, it’s a really fun place to be as a visitor in DC. 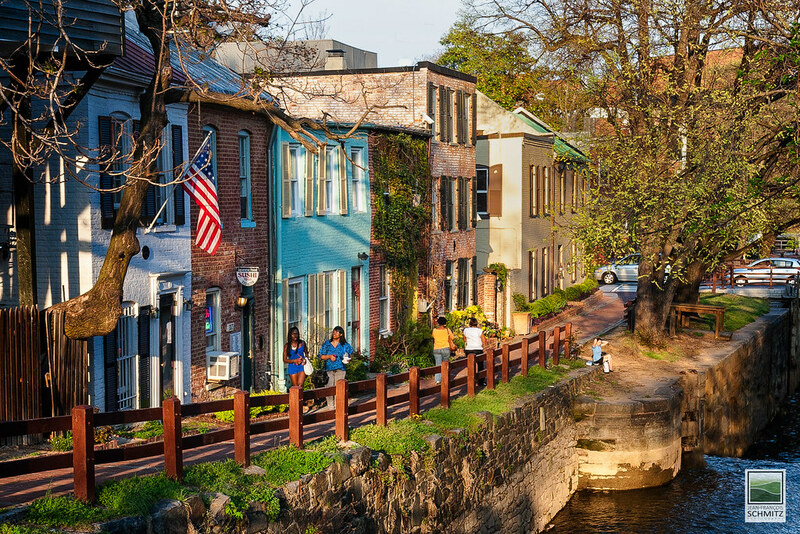 With its dozens of shops, famous bakeries, and historic significance, there’s a lot to see and do in Georgetown itself. It’s home to some of the city’s oldest homes and canals, and many of its institutions have been around a long time. While there’s no metro in Georgetown proper, it’s not far from the Blue/Orange/Silver lines at Foggy Bottom. Additionally, the Circulator bus will take you from Georgetown to the main sightseeing areas. Budget: There aren’t any hostels or ultra-budget hotels in Georgetown as it’s a fairly upscale part of Washington, DC. However, you may be able to find an Airbnb at a decent price (if you are new to Airbnb and book with that link, you can get $40 off your first stay!). 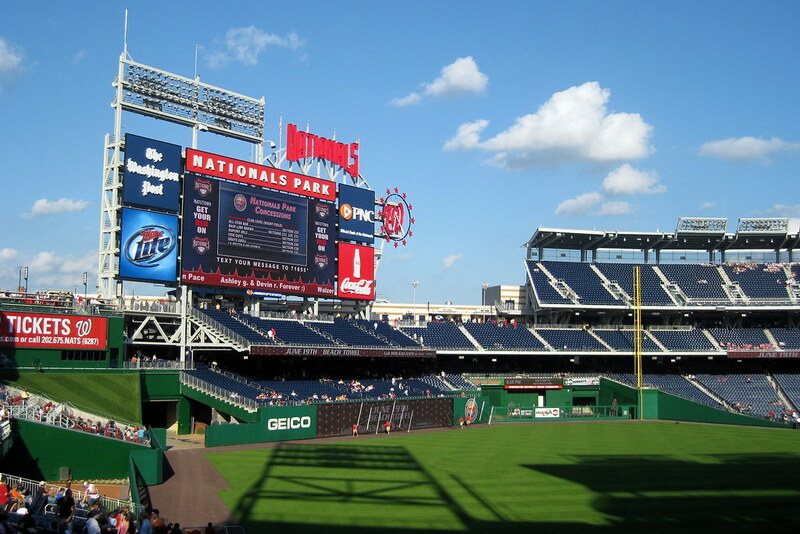 Within walking distance of the Nationals stadium is the up-and-coming neighborhood of Navy Yard. Here you can find a swath of young professionals hanging out at bars, breweries, or the newly-renovated waterfront. Marked by industrial buildings-turned-apartment complexes, this part of the city is currently undergoing a huge revival. Navy Yard is one of the most up-and-coming neighborhoods in the city, making it one of the best places to stay in Washington, DC if you’re looking for a local vibe. Accessible by the Green metro line and several bus routes, you can get to the main tourist areas fairly easily, but with all of the exciting things to do nearby, why not stick around? Want to book a different hotel than the ones we’ve recommended? Booking.com and Hotels Combined are both great places to start. I recommend checking both and comparing prices. Trying to find a flight to DC? Compare flights on CheapoAir and Expedia to snag the best deals. Planning on renting a car? Hertz has got you covered. Need travel insurance before your trip? We love and recommend World Nomads for all of your adventures – and they’ve got your back in Washington, DC. Click here to find out why we love them so much. 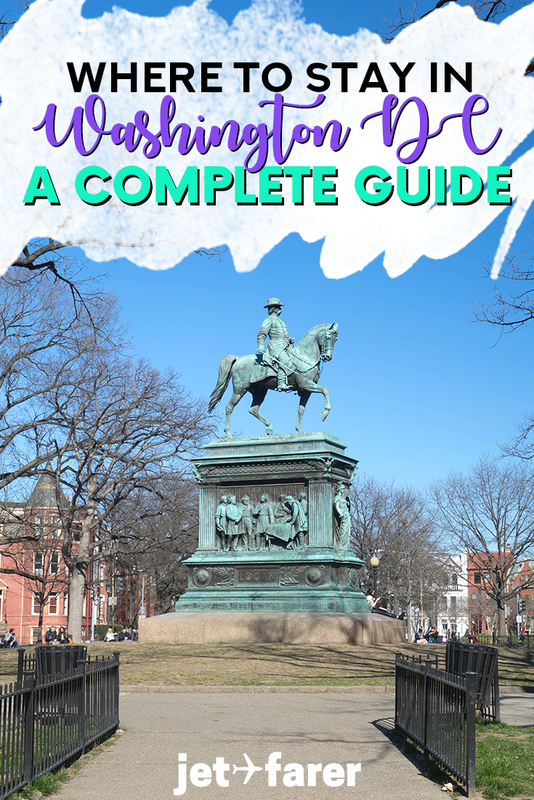 37 Things to Do in Washington, DC Besides Museums and Monuments – A guide for those of you who want to escape the crazy tourist crowds and find some more local hotspots. 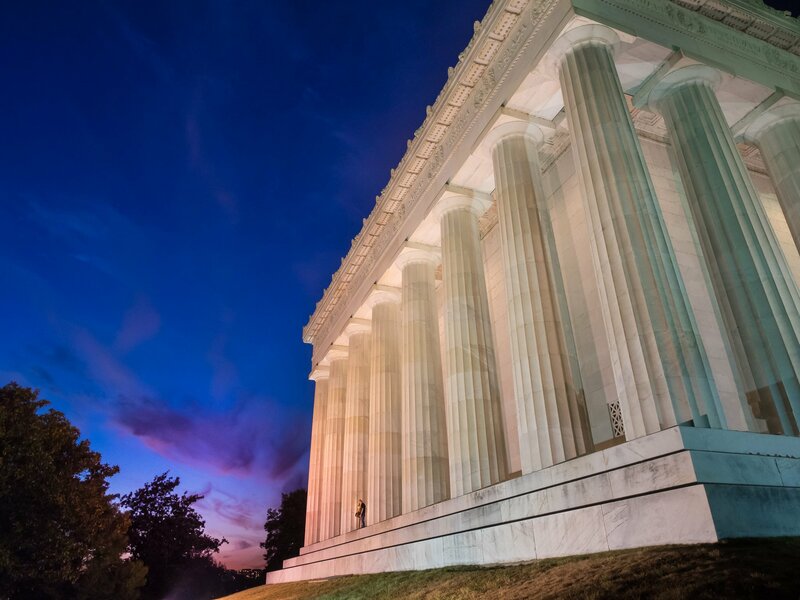 2 Days in Washington, DC: A Sample Itinerary – Your comprehensive weekend trip guide to Washington, DC.